After a decade of discussions and planning, work is finally under way on the $30 million Route 44 reconstruction project in Hartford, Conn. 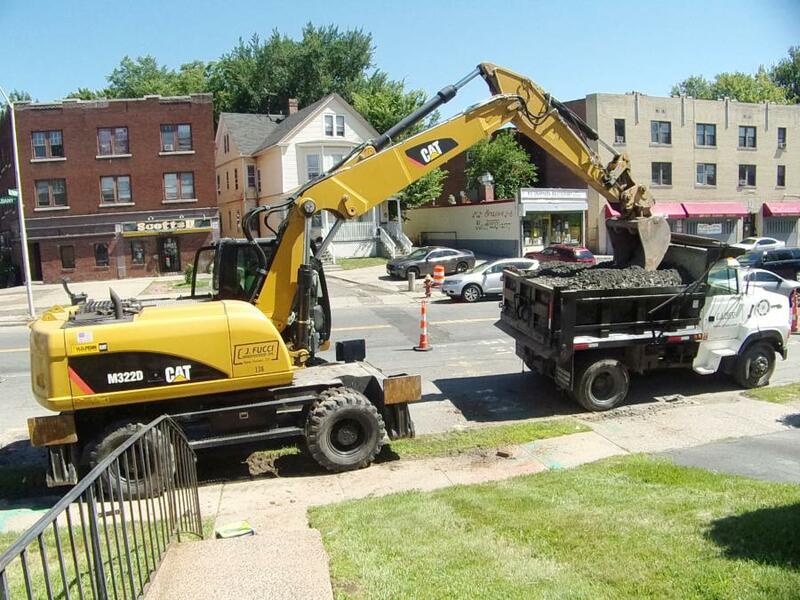 The project consists of operational, safety, roadway and streetscape improvements along Albany Avenue between Homestead Avenue and Bedford Street. The goal of the project is to improve pedestrian and vehicular safety throughout the corridor, along with streetscape and beautification enhancements. “As stewards of the public trust, it's our duty to inspect the construction work, approve changes and process payments so that the project is completed as promised and will last a long time,” said Donald Ward, P.E., assistant district engineer, Connecticut Department of Transportation (CTDOT). The project, which was presented to the public, the city and the Federal Highway Administration (FHWA) during design development, is 80 percent federal and 20 percent state funded. The design was initiated and overseen by the city, while CTDOT will function as construction manager. Pedestrian safety will be improved by several elements, including more signalized crosswalks and the addition of sidewalk bump-outs which decrease crossing distances. The introduction of new dedicated left-turn lanes at intersections will be one of many features that will increase traffic safety. They will help reduce the high crash rate that currently exists in the corridor. Approximately 9,000 residents live within a block of Route 44, and 19,000 vehicles travel through per day. It has one of the highest vehicle vs. pedestrian accident rates in the state. 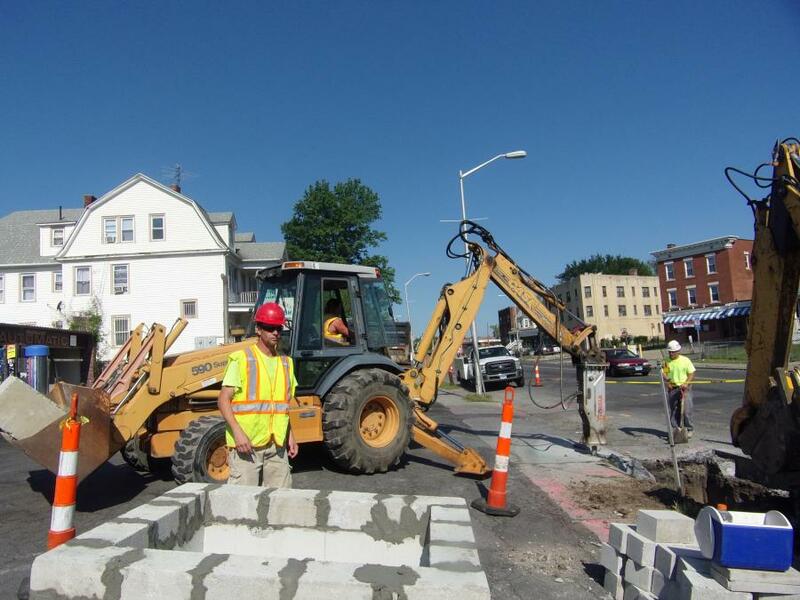 This project will slow the speed of cars and trucks, control access points into and out of properties and across Route 44, improve traffic movements to reduce conflicts and improve intersections to accommodate pedestrians. It's also needed to provide the same improvements other towns in the state have benefited from, to create a community that is pedestrian focused and will have a positive effect on the economy. CJ Fucci Construction is serving as the prime contractor. The project is a joint venture between CJ Fucci Inc. and NY Conn Corp.
Streetscape improvements include a total of 20 traffic signal improvements, of which five are new; 114,000 sq. ft. of concrete sidewalk; 108,000 sq. ft. of brick pavers; 20,000 linear ft. of granite curbing; 430 trees; 330 decorative street lamps; 38 bike posts; 31 trash cans; 68 benches; and 10 bus shelters. 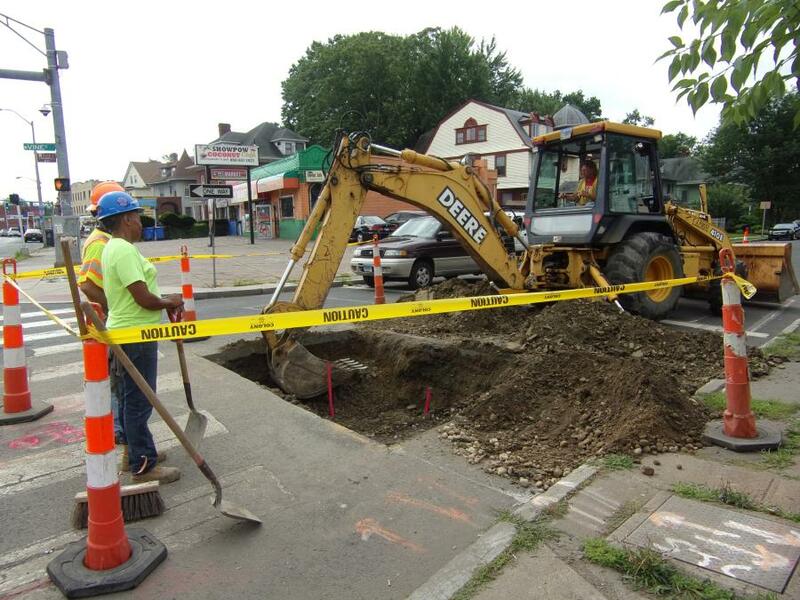 Pedestrian and vehicular safety will be significantly improved by the work taking place. “The period of time that pedestrians are in the cross walks will be shorter, because bulb outs are being constructed from the curb line, which shorten the length of the cross walk,” said Ward. “Bulb outs also clearly identify safe crossing areas so that pedestrians do not cross in the middle of the street. “Traffic will be slower because of the traffic calming measures being constructed, such as the bulb outs, trees and decorative lighting. Additional traffic signals are being constructed and improvements are being made as needed. Designated parallel parking will be created to eliminate vehicles from parking on the sidewalks, making it safer for pedestrians in the area. 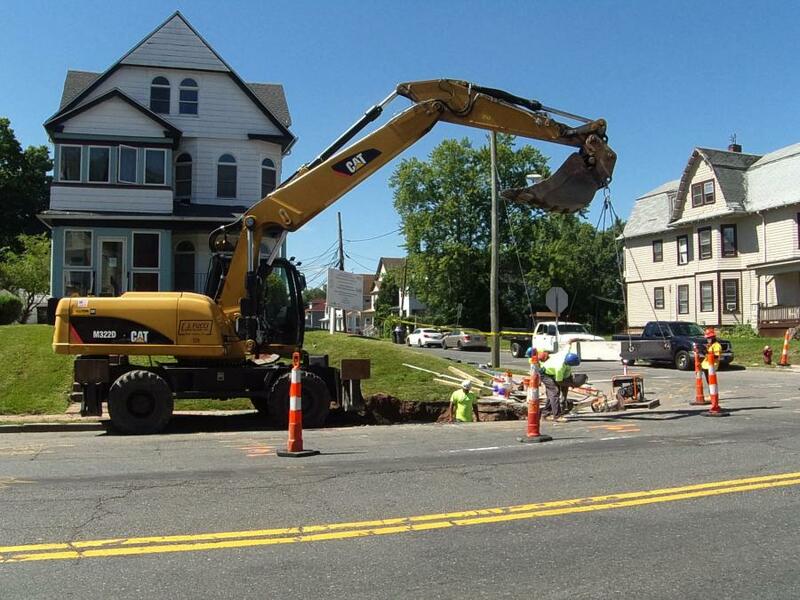 CTDOT project engineer Shawn Mangan said work includes saw cutting of the existing sidewalks in preparation for removal and reconstruction, as well as reconstruction and installation of drainage catch basins and pipes. Various testing also has taken place regarding gravels, processed aggregate base, catch basin units and tops, concrete pipe and conduit. The testing is necessary to ensure the materials are in compliance with the contract specifications, and that they will perform for the duration of its intended life. It also is a requirement in order to receive federal funding, and it's a requirement of CTDOT procedures. The main challenge for crews right now is the existing subsurface utilities. Work began on the reconstruction project in May 2017, and is expected to be completed by November 2019. Ward said the work comes not a moment too soon. Tectonic Engineering & Surveying Consultants P.C. is performing the daily inspection, processing daily work reports, sampling and submitting materials testing, taking measurements and making computations. It also monitors the contractor's use of Disadvantaged Business Enterprise (DBE) subcontractors on the job and the work that the DBE's are performing to ensure the contractor is in compliance with pre-award commitments. 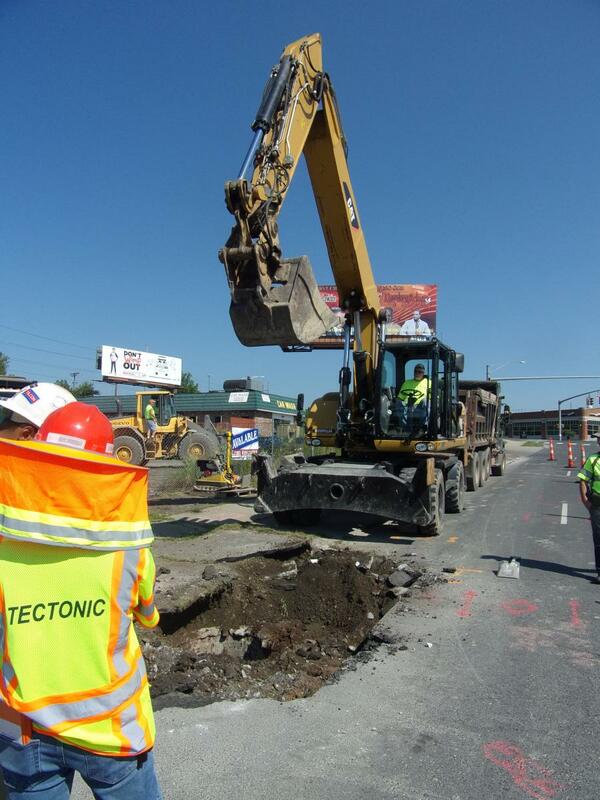 According to Giovanni Castro, resident engineer for Tectonic, equipment used on the job will include excavators, truck mounted augers, small cranes, pavement milling machines, paving machines and ground penetrating radar to investigate subsurface conditions and utilities. Materials include 1,830 cu. yds. of processed aggregate base and 16,000 tons of bituminous pavement. So far, weather has not been a factor. Regarding the work taking place, the impact on area motorists will be minimal. Only one lane of traffic of the four lanes of Route 44 can be closed between the hours of 7 a.m. to 5 p.m.
As for what residents can expect during construction, access to businesses will remain at all times, as will accessible paths to pedestrians. All travel lanes will stay open for vehicular traffic. If a lane must be closed, it will generally occur during non-rush hour traffic. Milling and paving will take place overnight. Ward said there has been a significant amount of public outreach on this project during design and construction. In addition, job opportunities for area citizens and local contractors have been an emphasis on the project. In an effort to provide some guidance on those opportunities, a job fair was held prior to construction, and a 10,000-hour on-the-job training requirement is noted in the contract. Ward said even the city's youngest residents are getting involved in the project, which has received a lot of exposure since it was first announced. “The Department, along with the director of arts and wellness for Hartford Public Schools, organized a project logo contest involving 7th and 8th graders from three local schools in the area. This was a very proud moment, and the winner's drawing is now being used on the project's website.